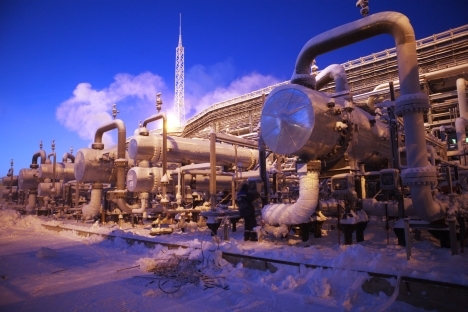 The outgoing year turned out to be a rather difficult one for the Russian gas giant Gazprom. Whereas, in 2011, it was the world’s most profitable company, the results for 2012 suggest that it may lose its top ranking. The Russian, state-owned gas monopoly’s unparalleled prosperity has been upset in 2012 by the “shale energy revolution” in the United States. The rapid increase in the extraction of cheap shale gas and the construction of factories where this gas can be liquefied before being shipped to Europe represent a real threat to Gazprom. Seventy-five percent of the Russian company’s revenues come from exports. For several years, Gazprom took a skeptical view of this threat. Later, the company came to see it as something far off in the long term. Suddenly, however, this threat is close at hand: According to the Ministry of Economic Development, Russia will have problems selling gas to Europe as early as 2016. Meanwhile, there are already complications in Europe: In September, the European Commission opened an antitrust investigation against Gazprom. The EU authorities have accused Gazprom of unfair pricing, splitting the gas market and blocking diversification of supply. Gazprom could be fined as much as 10 billion euros ($13.1 billion). Europeans consider the price of Russian gas to be unjustifiably high and its long-term contracts unwarranted — especially since shale energy from the United States is on the way. This year as well, Gazprom’s deals with Norway’s Statoil and France’s Total to jointly develop the Shtokman field fell through. The market situation changed, causing doubts about the profitability of the project, which could cost over $40 billion to realize. Even Vladimir Putin’s promise of additional tax breaks did not help. Gazprom’s problems on the foreign market have been compounded by problems on the domestic market. The share of gas supplied by independent producers has increased to 25 percent. Russia’s Federal Auto-Monopoly Service (FAS) has objected to Gazprom’s tenders to buy pipes. Meanwhile, Novatek (Russia’s largest independent producer of natural gas) has put an end to Gazprom’s monopoly on gas exports by signing a 10-year contract with Germany’s EnBW Group that is worth 6 billion euros. All of these events were reflected in Gazprom’s results: in the first half of 2012, net profits were already down 33 percent, as compared with the same period in 2011. Then again, there have been achievements — including gas supply to Europe. This fall, the first branch of the Nord Stream pipeline was opened; in early December, construction began on the South Stream pipeline, which is also bound for Europe. These two projects should reduce the dependence of Russia and her partners in Western Europe on Ukraine and Belarus, through which almost all supplies of Russian gas have been routed. This article was prepared using materials from Kommersant Dengi.